I love geranium essential oil. I love rose-geranium essential oil too. It’s flowery, it’s a little bit girly and it has a vibration of happiness and cheeriness. 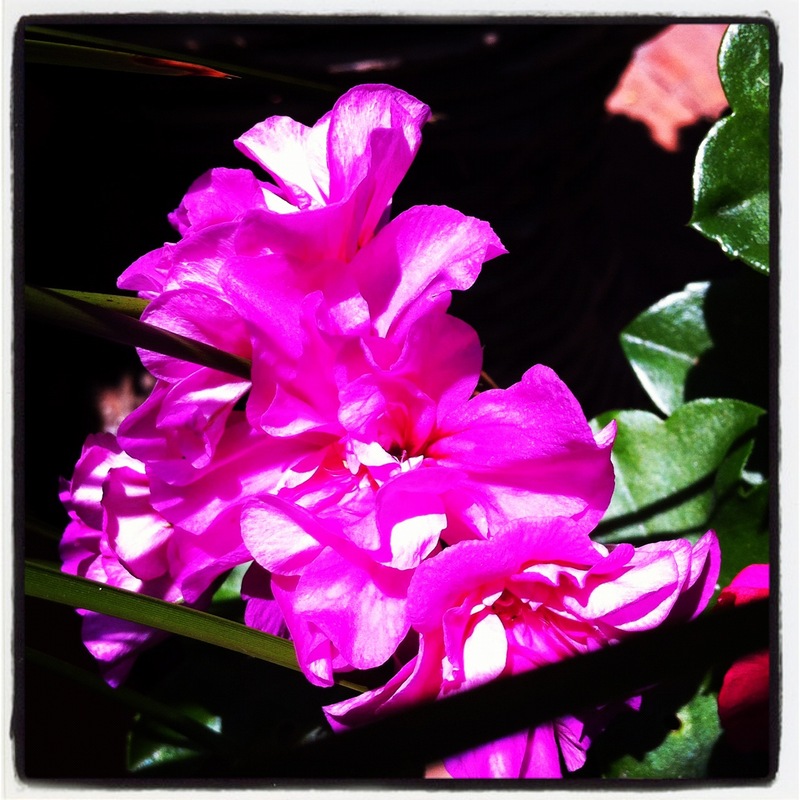 I just walked around the block and took a few pics of the lovely, brightly coloured flower. It loves the sun and so do I. Geranium essential oil is great for skincare and I often use it in my face creams. These pictures of geranium may not necessarily reflect the exact geranium plants that the oils are distilled from but there is definitely an aroma when you squish up a leaf and smell it (after you’ve asked the plant’s permission of course!). Geranium bourbon, originally from the Reunion Islands is considered the best geranium for skincare in Aromatherapy, but I’m not even sure if it is produced here anymore. The first plantings for production came from the island which was originally called “Bourbon”. It is the pelargonium graveolens plant that produces this oil. Rose geranium is produced from a cross of two different geranium plants – pelargonium cv rose. I often use Rose geranium for scenting a space and in personal mists, and geranium bourbon for skincare creams and old blends for the body. Some aromatherapy teachings claim geranium is a great balancing oil for the emotions as it’s main active ingredients geraniol and citronellol, work on the frontal and adrenal cortex of the brain. So basically, it’s a happy oil. You don’t need to be a genius to know that. Just take a huge whiff straight from the bottle and smile! This entry was posted in Aromatherapy basics & how-to's, Essential oil recipes, Essential OIls, Good things come from this and tagged almond oil, aromatherapy, aromatherpy skin care, beauty, carrier oils, essential oil recipes, essential oils, geranium essential oil, happiness, health, jojoba, mandarin essential oil, natural scents, nourishing aromatherapy body oil, patchouli essential oil, personal aromatherapy mist, ratios of essential oils to carrier oils, rose geranium essential oil, scent your space, smile, spearmint essential oil by suzannerbanks. Bookmark the permalink. Is the grapeseed oil you buy in Woolworths a carrier oil? WOW! So I don’t have to go all fancy for this stuff, the supermarket version will work? Also there is a HUGE difference between “fragrant oils” and “essential oils”. “Fragrant oils” are synthetic. “Essential oils” are natural and smell completely different. Excellent. This is exactly what I need to know Suzanne. A website or 2 would be excellent help.